SP Setia Bhd targets RM4 billion sales in its financial year ending Oct 31, 2012, driven by both local and foreign property sales. President and CEO Tan Sri Liew Kee Sin said the group achieved historic highs in both sales and profits for its financial year ended Oct 31, 2011. The group's full-year sales for FY2011 of RM3.29 billion represents a 42 per cent increase from its previous record high of RM2.31 billion set in FY2010. The group's profit after tax for FY2011 of RM322.4 million also increased 28 per cent from RM251.8 million in the previous year, the highest ever profit achieved by SP Setia for a financial year. "In spite of the difficult economic environment, we are confident we can achieve the target as we are able to deliver products that people want to buy," he said at a media briefing on SP Setia's financial results. Liew said sustained demand for properties in the group's existing projects in the Klang Valley, Johor Baharu and Penang will continue to underpin the group's sales performance in FY2012. FY2012, he said, will also see the launch of a slew of new projects which will enable the group to tap into new sources and corridors of growth to expand its market share. "These include Setia Eco Glades in Cyberjaya and Setia Business Park II in Tebrau Johor, and the Group's first high-rise luxury integrated residential and commercial project in JB City Centre called 88 Setia," he said. Over in East Malaysia, the group will shortly be launching its maiden project in Sabah, Aeropad -- an integrated commercial development located in Kota Kinabalu. On the international front, Fulton Lane in Melbourne is also doing well, and the group targets to launch the first development in Singapore to be called 18 Woodsville during the first half of 2012, he said. "In Vietnam, both Eco Lakes and EcoXuan, the group's second project, are expected to help augment sales," he said. SP Setia has proposed a final dividend of nine sen per share. Together with the interim dividend of five sen per share, total dividend for the year works out to 14 sen per share, representing a payout of approximately 59 per cent of the group's net profit. Liew said the group is also keen on the London property market and is looking at opportunities. As for the Singapore property market, he said, the group's property project there is focusing on locals who are upgrading to better homes. On Sept 28, 2011, SP Setia received a notice of take-over offer from Maybank Investment Bank Bhd (Maybank IB) on behalf of Permodalan Nasional Bhd (PNB) in respect of PNB's obligation to extend a take-over offer. On Oct 14, the Securities Commission (SC) approved the takeover offer by PNB. On Dec 2, 2011 Maybank IB, on behalf of PNB, submitted an application to the SC in relation to the proposed formalisation of certain incentives and management rights relating to the management and general conduct of business of the SP Setia group of companies to be entered into between PNB, Liew and SP Setia Bhd. The proposed arrangement and the offer document is pending the approval of the SC. Liew said the group is waiting for the SC's clearance. The management agreement submitted to the SC is a win-win plan for everybody in PNB and SP Setia, he added. PAVILION Real Estate Investment Trust (Pavilion REIT), the largest retail REIT in Malaysia, is eyeing more local assets to spur growth. 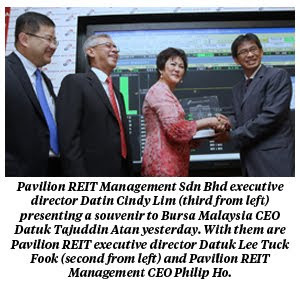 Pavilion REIT Management Sdn Bhd chief executive officer Philip Ho said the trust is seeking opportunities to expand its assets in Penang, Johor and the Klang Valley. Ho said Pavillion REIT will evaluate any financially viable investment opportunity that comes around. "As a retail real estate investment trust, our duty is to acquire malls and build up the portfolio," he told reporters after its listing ceremony here. Ho said the company's trustees had signed three rights of first refusal (ROFR) to acquire Farenheit88, the Pavilion Mall's extension, and a mall in USJ Subang Jaya. The mall, which contributes 96.4 per cent to the appraised value, has 1.3 million sq ft of net lettable area. It boasts of about 450 retail tenants, making it the largest premium retail fashion mall in Malaysia. Pavilion REIT yesterday fetched a 13.3 per cent premium over its offer price on its debut on Bursa Malaysia. It opened at RM1.03, 13 sen higher than its institutional price of 90 sen, with 15.7 million unit shares traded. Ho said the listing provides the company with direct access to capital markets, thereby strengthening its financial capacity to seize new opportunities in the country. "We are committed to enhance unitholders' return and value, both through the organic growth of our existing portfolio as well as visible growth via acquisitions," he added. SINGAPORE: Singapore yesterday announced new measures to cool the city-state’s housing market, saying foreigners who buy private homes will have to pay an additional stamp duty equal to 10 per cent of the property value. Permanent residents who already own a Singapore home will pay an additional stamp duty of three per cent when they buy a second and subsequent properties, while citizens who purchase a third and subsequent homes will pay three per cent. More than RM26 million worth of property was snapped up by Singaporean property buyers at HomeGuru’s inaugural Malaysia Property Showcase in Singapore on Dec 3-4. The event drew almost 900 property buyers and saw over 300 units of real estate sold. It involved the participation of six leading Malaysian developers, namely Andaman Group, Iereka Corporation Bhd, Lone Pine Group, Sime Darby Property, The Haven Sdn Bhd and UEM Land. In a statement today, PropertyGuru Group chief executive officer Steve Malhuish said, "In collaboration with its Singaporean counterpart, PropertyGuru.com.sg, HomeGuru established the Malaysia Property Showcase 2011 to create awareness of key Malaysian developments regionally, especially amongst interested investors in Singapore, Indonesia, Hong Kong and Thailand. It functioned as an optimal platform for the participating developers to network amongst each other and with prospective international investors, he added. Noting the event's success, Andaman Group head of sales and marketing Datuk Vincent Tiew said: "We are very inclined towards participating in future showcases with PropertyGuru Group at the helm." KUALA LUMPUR: The River of Life (RoL) project beautification works portion, of which the Ekovest-MRCB joint venture (JV) is said to be ultimately eyeing, is worth RM1bil, analysts said. It is understood that the entire RM2.2bil project which was announced on Tuesday for the RoL project includes the total cost of land development and sales adjoining the Klang and Gombak rivers with a total stretch of 10.7km. Thus, if the Ekovest-MRCB JV is successful in attaining the project, Ekovest Bhd which holds a 60% stake in the JV would be getting RM600mil worth of jobs while RM400mil worth will go to Malaysian Resources Corp Bhd (MRCB). The Ekovest-MRCB JV was on Tuesday appointed the project delivery partner for the first phase of the RM2.2bil RoL project to transform the rivers running through the heart of Kuala Lumpur through river rehabilitation, beautification of riverbank and river corridor developments. It is also understood that this project, if the Ekovest-MRCB venture were to eventually secure it, is expected to see Ekovest taking a front lead’s role given its majority stake in the JV. Ekovest shares closed 4 sen higher to RM2.64 yesterday but with little volume traded of only 10,000 shares. However, this project is likely to positively impact smaller-capitalised Ekovest more than MRCB should the Government decide to award the beautification works project to the Ekovest-MRCB JV. At this stage, with the current appointments, the Ekovest-MRCB JV will earn a fee of RM22mil equivalent to 1% of the project value over the project period of three years, which is an insignificant amount of RM2.9mil per year to MRCB over the next three years. RHB Research in a report yesterday said it expected the formal awarding of the contract for the beautification works and the physical works of this project to only start next year. Analysts are positive on the project and RHB Research had rated MRCB a “trading buy” with a target price of RM2.55 while Hong Leong Investment Bank had a target price of RM2.22 on the stock. Hektar REIT is buying two malls in Kedah for an estimated RM180 million, sources say. The malls are believed to be Kulim Landmark Central and Central Square Sg Petani. An announcement from the company is expected to be made as early as today.